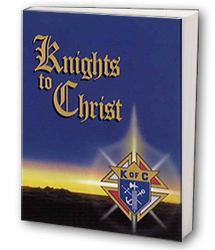 Knights to Christ book can be used as a Council Retreat by following a special format developed for Knights, by Knights. The objective is to provide the opportunity for Brother Knights to share their innermost spiritual beliefs and experience. The approach is to facilitate faith-sharing through “Knight to Knight sharing” in small groups, using the “Knights to Christ” meditations as spiritual tools for expression. The Retreat Facilitator’s mission is to establish a “comfort level” for open and uninhibited sharing; to establish a prayerful atmosphere; and to guide the Retreat efficiently. The Knights to Christ Retreat focuses on the 4 guiding Principles of the Knights of Columbus: Charity, Fraternity, Unity and Patriotism. These guiding Principles are thoroughly exemplified in the Meditation book, “Knights to Christ.” Further, pertinent questions at the end of most of the readings in the Book provide the means to explore our personal reflections on the subject matter. Contact Retreat Director Joe Gill via email at joegill@knightstochrist.org.